In order to do whatever we want with a dynamic system under control input, the dynamic system has to be controllable. Controllability plays a crucial role in many control problems, such as in complex networks , multi-fingered hands , spacecraft systems , dynamic power models , and so on. Note that nonlinear features are found in all practical systems almost. One of the nonlinear features in feedback control systems is saturation. Physical saturation is a key of control systems which are applicable to various aspects of engineering and science virtually [121, 153]. Saturation systems mainly include the following aspects: actuator saturation , state saturation , output saturation , multiple variable saturation , and so on. 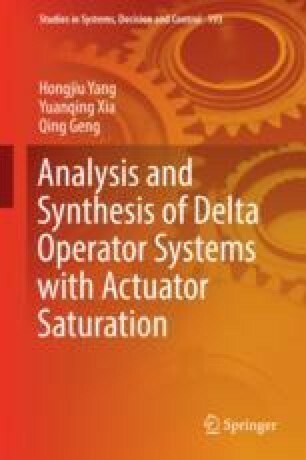 One of the most common saturation phenomenons is actuator saturation which has received much attention; please refer to [207, 209] and the references therein. A closed-loop system with actuator saturation is shown in Fig. 1.1.